Swamp Thing: The Series is a science fiction, action/adventure television series based on the DC Comics/Vertigo Comics character Swamp Thing. It debuted on USA Network on July 27, 1990 and lasted three seasons for a total of 72 episodes. It was later shown in reruns on the Sci Fi Channel. 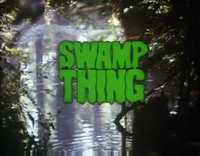 This webpage uses material from the Wikipedia article "Swamp_Thing%3A_The_Series" and is licensed under the GNU Free Documentation License. Reality TV World is not responsible for any errors or omissions the Wikipedia article may contain.